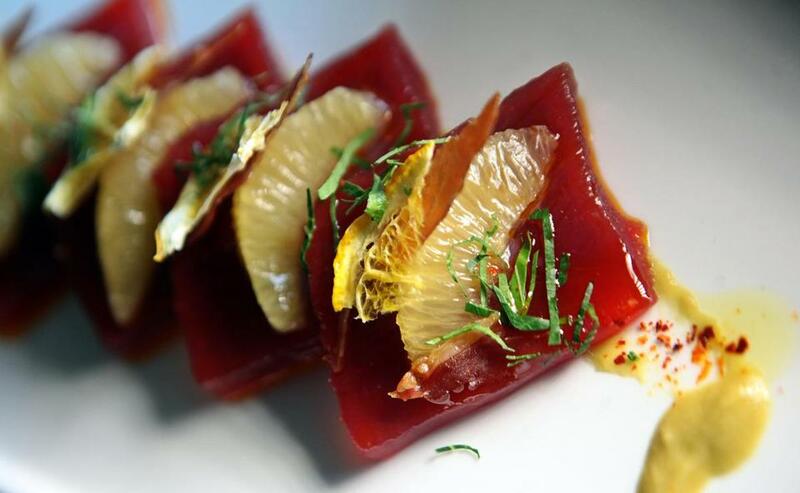 Tuna crudo is raw fish, chili, cured ham, and a thin slice of dried Meyer lemon over picholine olive puree. For years, French was just another word for fancy: elaborate, rich, unpronounceable, unaffordable. In short, a Big Night Out. The 1970s brought a welcome update at places like Hamersley’s Bistro with less butter in the sauces and less starch in the service. These bistros emphasized simpler preparations that let the ingredients shine in a notably more casual atmosphere. The food would be recognizable to Parisians, what they’d expect at a great neighborhood spot, with one exception: These American versions of French bistros were rarely in your neighborhood. All of which makes the opening of Sycamore in Newton Centre so welcome. Chef-owner David Punch, formerly of Ten Tables Cambridge, joined by Lydia Reichert, most recently a sous chef at Craigie on Main, make wonderfully creative use of fresh ingredients in deceptively simple preparations. Yet for all of its excellence, the restaurant is casual, unfussy, and friendly. It’s the best kind of neighborhood spot. You feel it from the start in the decor. The former site of the butcher shop John Dewar & Co. is rustic with exposed brick, simple but stylish lighting, butcher block tables, floor-to-ceiling windows, and a gleaming kitchen visible in the back. You enter the 16-seat bar and whether or not you sit there, it’s worth starting with one of bar manager Scott Shoer’s imaginative takes on classic cocktails. While the names are cute, make no mistake: These are serious drinks. The rye-based Old Old Fashioned balances sweet, bitter, and citrusy in just the right proportions. The Persephone gets its tang from pomegranate juice and fizz and froth from shaken egg white. The pale pink Ghost of Mary mixes spicy tomato water with citron vodka and stirs in a dill pickled string bean. “Bring me something that’s delicious but not sweet,” requests one in our group, and is rewarded with a bracing, refreshing Hemingway made with grapefruit, lime, sage, bitters, and rum. There’s also a well-rounded list of craft brews and a wonderful, if slightly pricey, wine list. Servers are friendly, knowledgable, and full of enthusiasm for what’s on offer. Snacks, little bites really, are simple and savory: crunchy cheese puff gougeres and pickled vegetables. You could skip them, but be sure to linger over the starters, which are exceptional. Chorizo croquettes are crispy, then creamy, then smoky, then gone. Pork rillettes are moist and mild, with a coarse-grained mustard and beer dipping sauce. Better still is red lentil soup with a spiced carrot fritter, touched by a little heat and fragrant with the aroma of toasted cardamom. And ricotta cavatelli made with ragu of game — pheasant one night, boar another. Made with an ancient machine, the pasta has just the right amount of bite and the sauce is a deep, luxurious, silky delight. Soup and pasta come on small plates that I could have eaten bowls of. I’ll be dreaming of both on the next cold night. Tuna crudo is also memorable, layering the flavors of luscious deep-red raw fish, chili, crispy salty cured ham, and a thin slice of dried Meyer lemon over a dab of picholine olive puree. Each flavor is distinctly delicious and eye-poppingly good in combination. Sides and salads include Brussels sprouts with crispy lardons and salty cubed cheddar, and a refreshing citrus salad of greens, grapefruit, pistachios, and avocado. While you could make a fine meal of starters and sides (and some of the diners were doing just that), you’d be missing the main courses. Don’t. A slow-cooked wine-y daube de boeuf is falling-apart tender, with caramelized onions, carrots, and parsnips adding sweetness. A perfect little bronzed quail, its legs crossed in a dainty yoga pose, is served with couscous mixed with dried cherries and hazelnuts. It’s a subtle and pleasing mixture of flavors and textures. 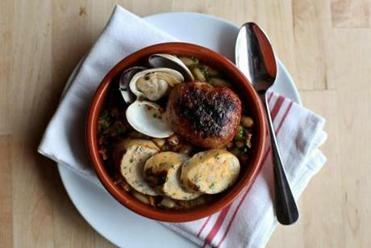 That’s also true of the Spanish seafood cassoulet: a bowl of delicate seafood sausage, slightly spicy house-made chorizo, and perfectly cooked littlenecks. The flavors of the sea mix with the salt and smoke of the pork over toothsome navy beans. The boudin blanc, a mild pale sausage, is served with whipped potatoes and sweet and sour purple cabbage. Deep, rich pork belly comes with a tangle of braised endive artfully draped over it. This is earthy, home-style food elevated by precision and creativity in the kitchen. The fish dishes also benefit from the chefs’ subtle imagination: Seared swordfish is sweetened by a curried pepper jam and accompanied by garbanzo beans prepared two ways: smoothly pureed and crisply deep fried. Corvina, a flaky white fish similar to snapper, is paired with a mix of sweet diced beets and toasted grains of farro. Our server suggests a dry, slightly briny rosé from Provence. He’s right: It’s a perfect complement (though we wish he’d mentioned the $56 price tag). Of the mains, only the za’atar-spiced roast chicken is merely good. An intriguing board of duck done four ways is also available for two to share. Desserts are drawn from bistro classics, slightly transformed. Tangy yogurt panna cotta has candied kumquats on the side. A chocolate ganache is dark and intense, offset by tart blood-orange sorbet, and shockingly green candied fennel. The licorice-flavored vegetable is perhaps more interesting as an idea than on the dish. More traditional lemon pot de creme with sweet-tart huckleberries and crumbly shortbread is delicious, but best of all are beignets with milk jam (a.k.a. dulce de leche). Light, puffy, sweet, gooey, and a perfect finish. We leave happy, full, eager to come back again. And why not? It’s in the neighborhood.